Amadou Haidara has been the jewel in Marco Rose’s Salzburg diamond midfield. His transfer to FC Salzburg has yet again proven the Red Bull scouting network to be a rousing success. Haidara is a 20-year-old Mali international who joined Salzburg from Malian side JMG Academy Bamako before being sent out on loan to feeder club FC Liefering in 2016. Upon his return to Austria, the Malian capitalised on several injuries and contributed two goals in six appearances for the club. The majority of his appearances thereafter came in the UEFA Europa League. His immense potential and consistent performances for the Austrian club have earned him a move to Bundesliga contenders RB Leipzig. African players have played an important role in European club successes with many notable names elevated to legendary status for their service. Didier Drogba, Yaya Toure, Samuel Eto’o and George Weah have made their mark on European football and lead their clubs to numerous domestic and European titles. Amadou Haidara is another young African player looking to make his mark in Europe. He has caught the attention of the German club, making a favourable impression on Europe’s elite. Naby Keïta made the move from RB Leipzig to Liverpool in a monstrous £53m deal in the summer. RB Leipzig has been on the lookout for a replacement and may have found one in the 20-year-old Salzburg midfielder. This analysis will profile and explain the strengths the Mali international will bring to the Bundesliga. Amadou Haidara can be classified as a box-to-box midfielder. He plays as a right-sided central midfielder in a midfield diamond for Marco Rose’s Salzburg. Tasked with the responsibility of interrupting opposition rhythm, late runs and defensive support, Haidara’s dribbling ability has been an effective weapon for Salzburg. The Malian has the ability to drive from deep and dribble centrally before looking for a passing option. His runs into the box have proved dangerous. Haidara’s long strides are comparable to Brazilian midfielder Ramires, whose unorthodox style of play caused havoc for the opposition. One player he will benefit from is Yussuf Poulsen. The Danish striker’s knock downs and hold-up play will create space for onrushing midfielders like Hadiara to take advantage of and score. Credit: Wyscout – Committing several OM players creating space for his teammates. Haidara can make marauding bursts forward catching teams off-guard and creating space for his teammates to exploit. 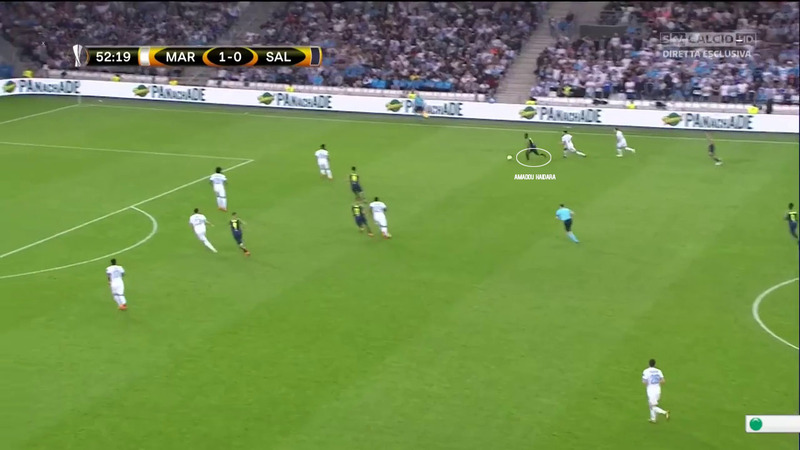 Above, for example, a single run from Haidara has committed six Olympique Marseille players to defend against him. He was still able to weave his way through the crowd. This isn’t to say his dribbling style is aesthetically pleasing, but rather sufficiently effective. If he runs into a crowd of players he will lose the ball. This hasn’t stopped him from attempting an average of 4.33 dribbles per game with a 75.8% success rate. If the opposition successfully doubles up on him he loses momentum and the ball is lost. In the same match against Marseille, the Mali international attempted six dribbles and successfully completed four to give him an 80% success rate. Amadou Haidara can score goals. The potential to become a goal-scoring box-to-box midfielder is visible but needs to be harnessed and developed. During his tenure with Salzburg he may have only scored nine goals across his three years at the club. However, his clever late runs into the box created space for him to remain unmarked and score. The match against RB Leipzig in the UEFA Europa League showed good movement from the Malian. It also demonstrated how FC Salzburg took advantage of the open spaces left by RB Leipzig and exposed the abundance of space in behind Konrad Laimer. The Austrian right-back was caught out time and time against the pace of Munas Dabbur and Reinhold Yabo who played off the shoulder. 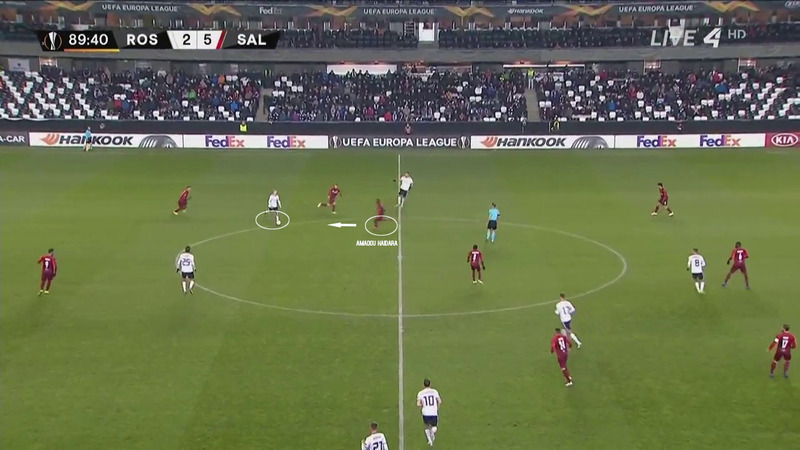 RB Salzburg’s midfield attempted a variety of deliveries into the quick forwards during the build-up. Credit: Wyscout – The movement of Salzburg’s attackers has distorted Leipzig’s defensive organisation. Reinhold Yabo positioned himself in between the centre-back and left-back with neither player closing him down. This meant Amadou Haidara was unmarked and had a free run into the box. Andreas Ulmer’s pass to Hannes Wolf provided the chance to play a quick one-two combination. This allowed the left-back to run into space with Konrad Laimer caught out of position, indirectly allowing three players to make a run into the box. Haidara was afforded an abundance of time and space, but timing his run was key. Notice how Haidara ends up with a clear shot at goal with no one around him to intercept or tackle him. Credit: Wyscout – Haidara in acres of space. RB Leipzig sold Naby Keïta to Liverpool in the summer of 2018 for a sizable fee and needed a replacement. Naby Keïta’s role at RB Leipzig was that of a dynamic number eight who excelled at anticipating, tackling and passing. An asset in both defence and attack, Keïta’s dribbling ability caused havoc in both Austria and Germany. The tactically aware Liverpool midfielder would counter-press effectively under Ralph Hasenhüttl in their famous 4-2-2-2 hexagonal formation. During the defensive phase, Keïta would position himself next to Diego Demme or Kevin Kampl. Both would then press players entering their zone. As we’ve said earlier, Haidara also plays as a central midfielder who looks to tackle and make driving runs into the opposition penalty area. The comparison between the two players was inevitable, but can Haidara be compared to his predecessor? Credit: SofaScore. Amadou Haidara statistics from the 2017-2018 season. Credit: SofaScore. Naby Keïta statistics from the 2017-2018 season. The initial analysis would be Haidara’s defensive statistics are marginally better than Keïta’s. I want to focus on their interceptions and tackles per game statistics. Where Keïta made 1.4 dribble attempts a game, Haidara made 1.6 dribble attempts per game. The stark difference behind the comparison is the formation they both played in. Keïta played in a 4-2-2-2 with Haidara in a 4-1-2-1-2. The Mail international usually partnered Diadie Sammesekou and Xaver Schlager. Keïta played in the double pivot alongside Diego Demme or Kevin Kampl. Haidara therefore had more freedom to attempt more tackles and gamble on interceptions without worrying about leaving his defence exposed. For Keïta to have comparable statistics despite being relatively handicapped in midfield is quite astonishing. 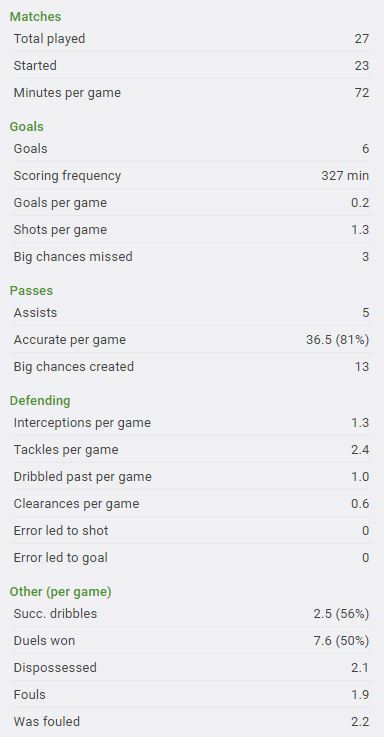 Keïta’s passing statistics are much better. He’s seen as an exciting and accurate passer who is able to create opportunities from deep, whether it’s through his running or pass accuracy. Having created more big chances (13 to Haidara’s 9) and a higher pass accuracy rate, Keïta’s ability to break down stubborn defences is an impressive and necessary trait. Both players play in systems that require intense pressing and counter-pressing, making Haidara a natural fit for Rangnick’s system. Even if Haidara isn’t the most proficient passer he still contributed five assists and will improve as he moves into a better league playing with and against better players. After looking at his statistics against Keïta, we will take a closer look at Amadou Haidara’s defensive abilities including his tackling and interceptions. These are two key attributes that Haidara is good at but can improve upon. He has the ability to position himself in the right positions and anticipate movements but is slightly reliant upon having an extra man in support. Credit: Wyscout. Notice the number of Salzburg players behind Haidara as he goes into attack. As Rosenborg try to build up another attack against Salzburg, Haidara is attempting to make a run from deep to try and dispossess the player high up the pitch. Notice there is sufficient cover behind Haidara who attempts to push forward and anticipates the run of the opposition midfielder. He ends up with a perfectly timed tackle to initiate a counter-attack. Having said his tackling needs improving, his pace and athleticism allow him to be dynamic in both boxes making his defensive contributions decisive. Against Marseille above, we can see Salzburg defending a counter deep in extra time with the scores level at 2-2 on aggregate. Haidara is in the midst of a sprint and manages to successfully tackle and recover the ball. This exemplifies his athleticism and dynamism and shows us a glimpse of what he can offer RB Leipzig against some fast-paced, counter-attacking teams in the Bundesliga. Amadou Haidara will make an excellent addition to Leipzig’s roster along with new recruit Tyler Adams from New York Red Bulls. The Malian midfielder will bring a host of useful qualities to a Leipzig side yet to fill the Naby Keïta-shaped void. Their hope is Amadou Hadiara will be the answer and his talents can be nurtured and further developed into the player that Keïta is. With Julian Nagelsmann set to take over the East German club for the 2019/2020 season, we could see an even better version of the player thanks to the new manager’s innovative techniques and incredible man management skills.